J. C. Watson discovered asteroid #105 Artemis. M. Wolf discovered asteroid #733 Mocia. K. Reinmuth discovered asteroid #1051 Merope. H. Van Gent discovered asteroids #1667 Pels, #1738 Oosterhoff and #1689 Floris. S. Arend discovered asteroids #1314 Paula and #1315 Bronislawa. Y. Vaisala discovered asteroids #1471 Tornio, #1494 Savo, #1498 Lahti, #1530 Rantaseppa and #1532 Inari. The V2 Blossom IVC Solar/Biological mission was launched from White Sands, New Mexico, the third V2 flight carrying a live Air Force Aero Medical Lab monkey. The V2 Blossom IVC Solar/Biological mission was launched 16 September 1949 from White Sands, New Mexico, the third V2 flight carrying a live AF Aero Medical Laboratory monkey, Albert III, who survived the flight but died on impact. The flight was launched at 16:19 local time, and reached an altitude of 4.2 km. It carried Composition, ionosphere, meteorites, solar and cosmic radiation, sky brightness, biological experiments for the Air Research and Development Command. S. Arend discovered asteroid #1613 Smiley. Goethe Link Observatory discovered asteroids #2023 Asaph and #3520. NASA astronauts Armstrong, Aldrin, and Collins reported on their Apollo 11 mission to land on the Moon to a joint session of Congress. US President Nixon predicted Americans would be on Mars in the 1980s. Crimean Astrophysics Observatory discovered asteroids #2163 Korczak and #2170 Belorussia; J. Gibson and C. U Cesco discovered asteroid #1919 Clemence; P. Wild discovered asteroid #1892 Lucienne. Japan launched the Jikiken (EXOS-B) ionosphere research satellite from Kagoshima. Japan's Institute of Space and Aeronautical Science at the University of Tokyo launched the Jikiken (EXOS-B) ionosphere research satellite from Kagoshima on 16 September 1978. It carried a stimulated plasma wave experiment, made natural plasma wave measurements, plasma parameter measurements by a VLF Doppler technique, electric field probe and plasma density measurements, performed energetic particle analysis, and included a controlled electron beam emission experiment. The 90.5 kg spacecraft was built as a polyhedron with 38 faces, 0.6 meters high, 0.75 meters in diameter, with attitude control through spin stabilization and an expected life of two years. Z. Vavrova discovered asteroid #3022. A. Mrkos discovered asteroid #3137; K. Tomita discovered asteroid #3765. USSR launched Ekran 9 from Baikonur to transmit Central Television programs to a network of receivers for collective use, positioned in geosynchronous orbit at 99 deg E.
USSR launched three Glonass component satellites (Cosmos 1778, Cosmos 1779 and Cosmos 1780) from Baikonur on a Proton booster, testing components and apparatus of the space-based navigation system. The Montreal Protocol was signed by two dozen nations to protect the ozone layer from depletion by curbing harmful emissions. An Ariane 3 launched from Kourou carried Australia's Aussat A3 and Europe's Eutelsat I F4 communications satellites to space, initially positioned in geosynchronous orbit at 164 deg E and 10 deg E, respectively. USSR launched three Glonass component satellites (Cosmos 1883, Cosmos 1884 and Cosmos 1885) from Baikonur on a Proton booster, testing components and apparatus of the space-based navigation system. The US Navy launched the Transit-O 27 and Transit-O 29 navigation satellites into orbit from Vandenburg, California, on a Scout G-1 booster. Japan launched the Sakura 3B communications satellite from Tanegashima, which was positioned in geosynchronous orbit at 149 deg E 1988; 136 deg E 1988-1997; 154 deg E 1997. USSR launched three Glonass component satellites (Cosmos 1970, Cosmos 1971 and Cosmos 1972) from Baikonur on a Proton booster, testing components and apparatus of the space-based navigation system. During the 4h 18m Mir EO-14-1 EVA, Mir cosmonauts Tsibliyev and Serebrov began installation of the Rapana truss on the Mir space station. During the 7h 05m EVA STS-51-1 EVA, Discovery astronauts Walz and Newman tested tools and techniques for extravehicular activity. During the 6h 5m STS-64-1 EVA, Discovery astronauts Lee and Meade tested the SAFER emergency maneuvring backpack. During the 6h 46m STS-69-1 EVA, Endeavour astronauts Voss and Gernhardt tested tools and techniques for extravehicular activity. NASA launched STS 79 (Atlantis 17, 79th Shuttle mission) to space for the fourth Shuttle-Mir docking mission. An Ariane 44LP launched from Kourou carried the Panamsat 7 communications satellite into space, which was positioned in geosynchronous orbit at 68 deg E.
China launched Kaituozhe 1 from Taiyuan, the second attempted launch of the KT-1 booster, intended to place a 40 kg microsatellite called PS-2 into a 300 x 300 km polar orbit. However, the fourth stage failed to ignite. NASA and the Naval Research Lab set a world record for the most rocket engines used on a single flight: a total of 44 engines, 37 of which were used to pump dust into the ionosphere, rather than for thrust. 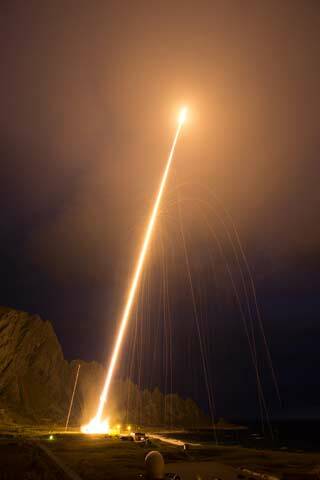 On 16 September 2015, NASA and the Naval Research Laboratory (NRL) launched a Black Brant XI sounding rocket in an experiment that set a world record for the highest number of rocket engines used on a single flight: a total of 44 engines. Thirty-seven engines were used to create an exhaust cloud for the experiment. Three engines were used to actually provide thrust to launch the rocket, the remaining four were used as spin motors to control its position. The experiment, called the Charged Aerosol Release Experiment II (CARE II), was led by Dr. Paul Bernhardt of the NRL to study "dusty plasmas" - electrically charged mixtures of gas and bits of dust that can occur naturally as noctilucent clouds in the mesosphere (the part of the atmosphere about 30-50 miles (50-80 km) above the surface). Noctilucent clouds are the highest clouds in the Earth's atmosphere, and dusty plasmas have also been observed in Saturn's rings. Since dusty plasmas can disrupt radar signals, learning more about them is important. The mission lasted about 10 minutes, flying as high as the ionosphere, about 186 miles above Earth. The dusty plasma was created on the downward leg of the flight by injecting aluminum oxide dust particles and combustion products upwards into the ionosphere. Charging of the dust and ion charge exchange with the molecules produced plasma particles moving at hypersonic velocities. Instruments both carried by the rocket in a daughter payload and on the ground were used to detect the resulting disturbances in the ionosphere and collect other data for the experiment.